A member of the Capsicum family, habaneros are a spicy chili pepper affiliated with jalapenos and bell peppers. A native of South and Central America, as well as the Caribbean, habaneros are among the hottest chili peppers there are. Habanero peppers have multiple health benefits, but their spiciness means you should consult a doctor before eating habaneros if you get heartburn or have irritable bowel syndrome. 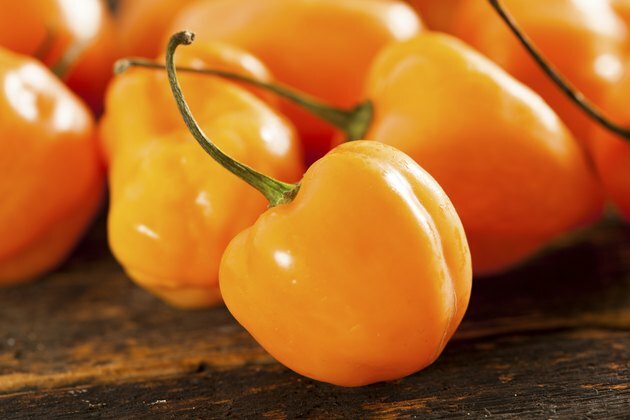 A 4.5-gram serving of habanero peppers has 15 calories and no fat. A single serving of habaneros also has 3 milligrams of sodium, 1 gram of protein, 2 grams of sugar and 4 grams of carbohydrates. The same size serving also has 1 gram of dietary fiber. You can rest easy knowing that adding habaneros to a dish for extra flavor will not greatly increase the sodium, fat or calorie content. A single serving of habaneros has 128 milligrams of potassium, which is a relatively high amount for such a small serving size. According to "The Herb Society of America's Essential Guide to Growing and Cooking with Herb," habaneros are also high in vitamin C. Green habaneros, unripe peppers, have a higher vitamin C content than their red and orange counterparts. As one of the hottest chili peppers, habaneros have a high capsaicin content. A phytonutrient, capsaicin is a natural anti-inflammatory that can help treat arthritis and headaches. Capsaicin works as an anti-inflammatory by reducing your body's production of Substance P, which is what causes the swelling and pain that occurs alongside inflammation. A study published in "Cell Signal" in 2003 confirmed that the capsaicin from hot peppers showed anti-inflammatory properties. A diet rich in habanero peppers may help regulate insulin levels, especially in people who are already overweight. A study published in 2006 in the "American Journal of Clinical Nutrition" concluded that capsaicin reduced the likelihood of insulin spikes following a meal. Scientists concluded that regular capsaicin consumption could help diabetics control their insulin levels. Scientists also found that meals containing capsaicin increased fat oxidation, which may indicate capsaicin's ability to regulate obesity. However, further study on human subjects is needed. What Are the Health Benefits of Capsaicin? Do Red Bell Peppers Burn Fat? Can Eating Cayenne Pepper Help Unclog Arteries?